We’ve moved from July to August, and you all know what that means. No, not that. It’s county fair season again. 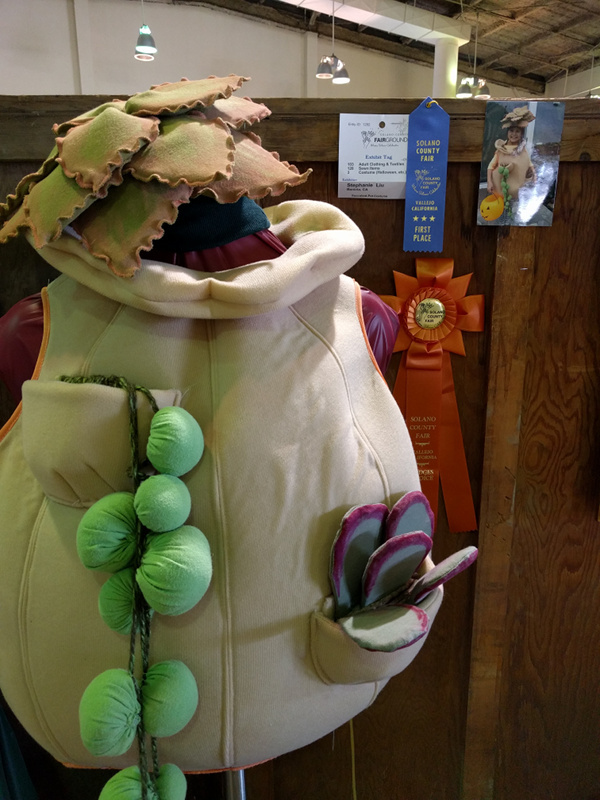 After a year’s absence, we returned to the Solano County Fair. And, much as I hate to say it, it wasn’t as good as last time. There was a complete absence of Xathanael Todd in the art show. Yes, there were some nice pieces–I particularly liked Stephanie Liu’s “Succulent Pot Costume”–but nobody stepped up to give us the sustained off-kilter artistic vision Xathanael did so well. Once again, the fair failed to provide strawberry shortcake. And, while I can’t give firm numbers, I’m fairly sure there were fewer critters. Certainly the carousel lacked anything more than boring horses, but even the live animals seemed sparser than I recalled. All that said, don’t think I didn’t have a good time, because I did. Just not quite as good as in 2015. This year was the year of the rabbit nose twitch for me. I just found them insufferably cute and took several videos. I’ll note in passing that some of the artwork that wasn’t part of the art show was more entertaining than what was. 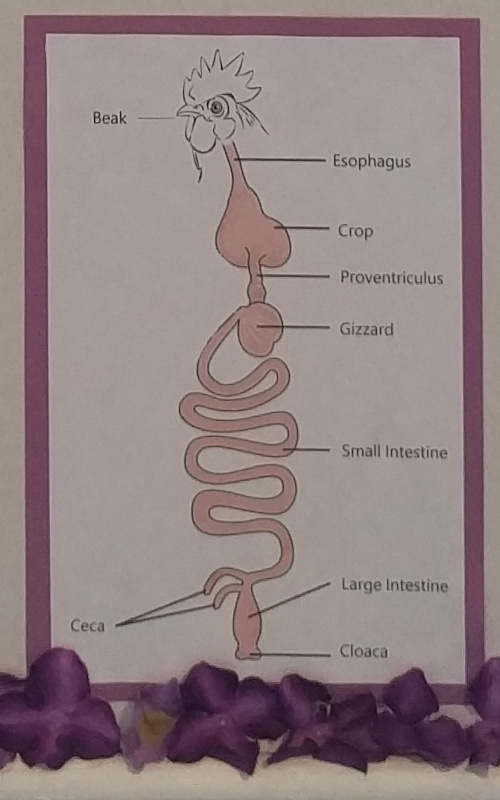 In particular, the deconstructed chicken–part of an educational sign detailing “The Digestive System of Chickens”–should have gotten a blue ribbon. It’s the row of violets on the ledge below the art that really puts it over the top. This year won big on music. Two years ago, we didn’t hear anything particularly distinctive, but this year we caught Metalachi. Full disclosure: We didn’t stumble over the band at the fair, we went intending to catch their show. Heavy metal done mariachi style. Great concept, well executed. I’d like to hear them take on some original compositions. There is, after all, only so far you can go as a cover band. But in fairness, not every musician is a composer. And on that subject, need I mention that I was hoping they’d go for the multi-cultural trifecta and do a BABYMETAL number? I was and they didn’t. Perhaps a bit too much to hope for. The video isn’t great. Between the backlighting and the demolition derby next door, I’m surprised it turned out as well as it did. If you go in search of better videos, be warned that they tone down the act for the family friendly venue. And then there was the food. The “Shark on a Stick” folks were back, but I again declined. A BBQ beef sandwich did quite nicely for protein and vitamins and set me up well for the obligatory “only at a fair” food dessert. 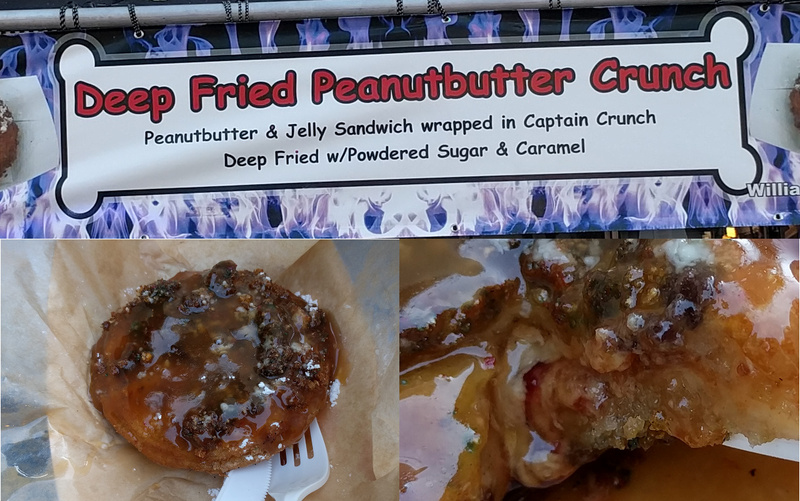 Behold this wondrous offering from the “Everything Deep Fried” food truck! Granted, the caramel comes off as something closer to syrup, but frying the sandwich turns the peanut butter into a delicious oozing mass and the jelly is transformed into sweet streams of liquid. The cereal adds a nice note of crunchiness that the syrupcaramel can’t soggify. It was well worth the experiment, even knowing I’ll be visiting my doctor to discuss my cholesterol later this week. In all, despite the minor disappointments, it was a successful day at the fair. 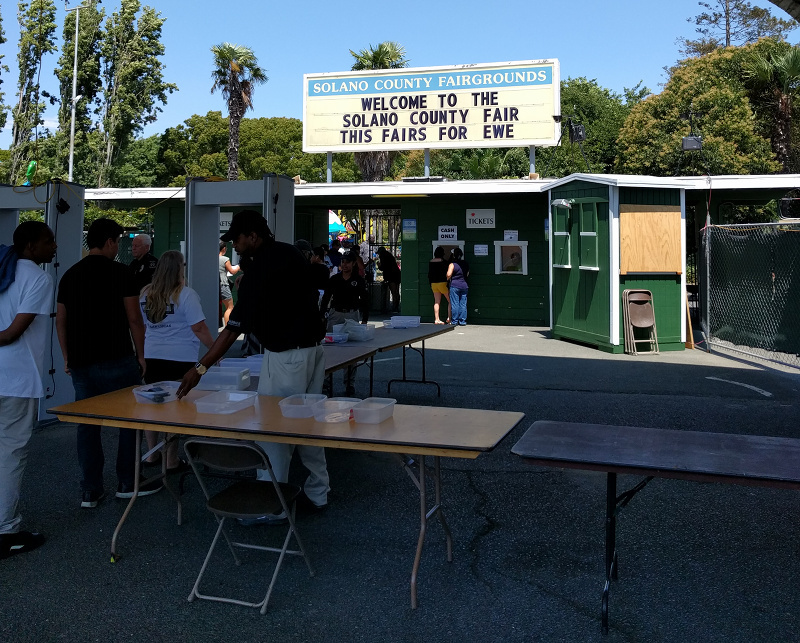 And remember: the Solano County Fairs for ewe. No, really, it says so right over the entrance, lack of apostrophe and all! Most of the time, the crew does nothing to dispel the popular belief that–iconic Super Bowl commercials notwithstanding–herding cats is impossible. Note Yuki’s untidy sprawl and their asymmetrical arrangement. Rhubarb’s Ears of Disapproval may be as much for the sloppy design of their collective pose as for the claws in his back and Yuki’s catfood breath. But every so often, probably just to keep us guessing, they pull off something quite artistic. Observe the careful balance of the gentlemen: Rhubarb’s tail echoing ‘Nuki’s hind leg, the inverted symmetry in the angles of their bodies relative to the baseline (the edge of the bed). And then there’s Sachiko in the central position. Her tail is extended straight back in counterpoint to the curves of her elders’ hindmost parts. Her face is turned to an angle almost exactly midway between Watanuki’s full-face and Rhubarb’s three-quarter. But despite her youth, she shows strong artistic instincts, carefully positioning herself at a slight angle, rather than taking up a perfect perpendicular to the baseline. Had she done the latter, the composition would be lackluster; a bit of competent draftsmanship at best. Instead, her choice elevates it to art. I don’t talk about the publishing industry very often on this blog. 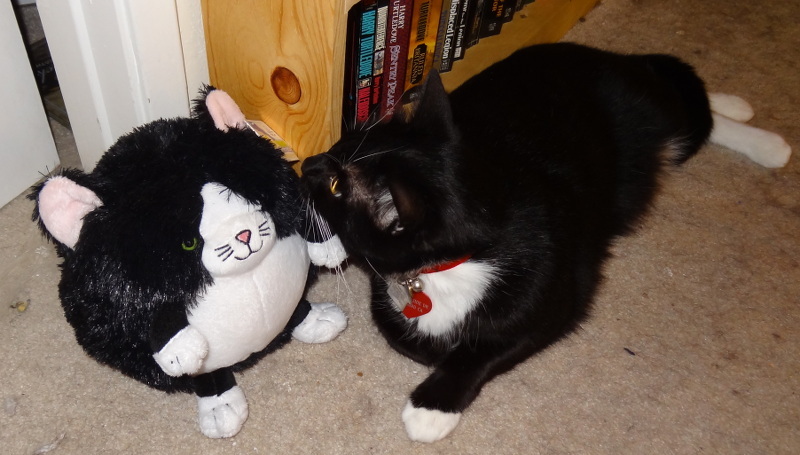 That might seem a little odd–this is a writer’s blog, after all. But in reality, most publishing news is concerned with royalty rates, rights management, and corporate mergers and acquisitions. 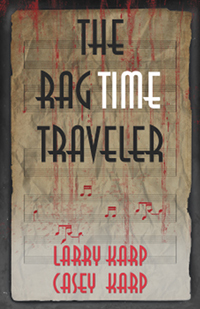 Riveting for writers, but sleep-inducing for 99% of my readers. However, every so often a story with more general appeal appeal turns up. Oddly, they seem to travel in packs. Today, we’ve got a quartet of publishing stories with technological angles. 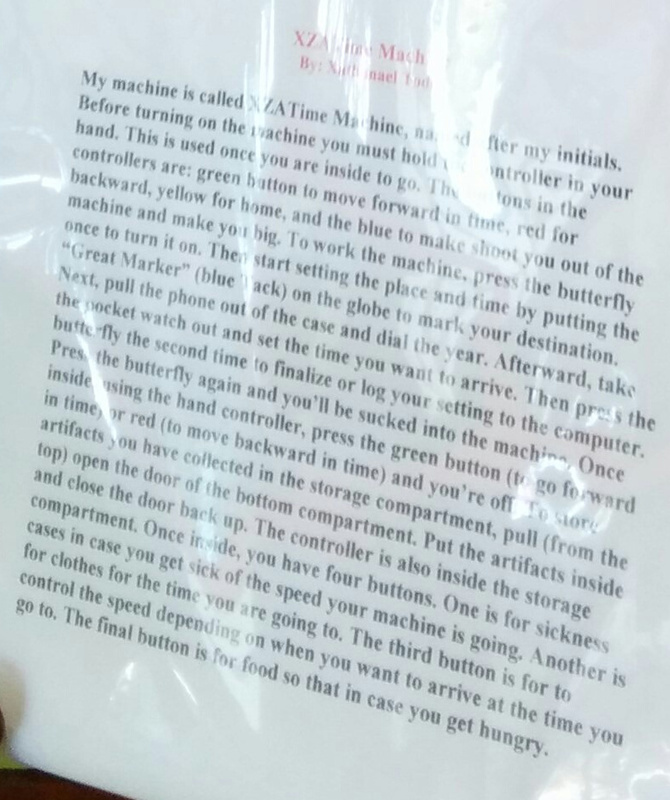 Over at Publishing Perspectives, Mark Piesing has a piece on robojournalism and robowriting. Fascinating, really. Yahoo uses software to write thousands of stories every week for its Fantasy Sports sites. AP uses programs to generate thousands of quarterly earning reports. Some companies use the technology to produce company reports and online customer service. If you’ve ever thought the customer service rep in your online chat seemed a bit robotic, you might have been right. But perhaps not: Mr. Piesing cites a study in which readers found a robot-written report of a football game more credible than one written by a real reporter. Mr. Piesing seems to believe that robojournalism is the future of the industry–he tells us that, according to unnamed commentators, “90% of journalism read by the public will be written by robots” within a decade. My immediate reaction was that he was hopelessly pessimistic. I–and Mr. Piesing’s experts–don’t believe software will ever be able to replace investigative reporters. Can you imagine a program replacing our buddy Jaxon: uncovering and reporting the multitude of human failures that led to the Bay Bridge Bolt Botch? But then I started thinking more deeply. There’s a key phrase in that quote above: “read by the public”. How many people are actually reading Jaxon’s articles? How many more people read the headline, think “Another boring bridge problem,” and move on to the Sports section? Next time you go shopping, take a look at the magazines near the register. How many people do you see sneaking a peek inside? The circulation figures don’t begin to give a full picture of how many people read those journals. Can you honestly tell me that any of the articles were written by humans? Amazon is getting a fair amount of press for its Kindle Convert software. Stories are billing it as the text equivalent of CD ripping software, in that it allows you to convert your physical books into ebooks (Kindle format only, of course), just as a CD can be converted into mp3s. Never mind the fact that the user reviews are uniformly negative, or that scanning books is considerably more labor-intensive than ripping a CD. News stories talk about Amazon’s encouragement of piracy and conspiracy to steal from authors. Let’s face it: ebooks are already easily available across the Internet. Kindle Convert isn’t going to make a bit of difference in either direction. The current Amazon sales rank (#41 in Software, squarely between Norton Security and H&R Block Tax Software) is a direct reflection of the current free publicity and heavily discounted price ($19, previously $49). My suspicion is that the overwhelming majority of the copies sold since the price drop will either never be used, or will be used to convert illicitly-downloaded books into a Kindle-friendly format. Speaking of Amazon, have you considered the implications of their recommendations? When you look at a book, they suggest others you should buy. Those recommendations come, not from any similarity between the books or any assessment of quality, but from purchase records: other people bought them at the same time they bought the one you’re looking at. A company called trajectory thinks they have a better mousetraprecommendation tool. According to a piece in Publishers Weekly, their software classifies the content of books with regard to more than thirty attributes, including mood, pace, and intensity. That allows them to recommend similar books in very much the same way that Pandora recommends similar music. And, as with Pandora, the more books they’re able to classify, the better their recommendations will get. Currently, trajectory’s focus is on selling to libraries and booksellers, but they’re also looking to sell recommendations to self-published authors. That’s a little worrisome. If writers can bias the system to preferentially promote their book when certain attributes come up, what’s the point of trajectory doing the analysis in the first place? And, speaking from the author’s point of view, if trajectory catches on with booksellers, getting that preferential placement could become a “must do”. Can you imagine the bidding wars for keywords that would link to your book from the current bestsellers? Finally, here’s an art project that completely misses the point. Thijs Biersteker has created a book cover that uses facial recognition software to decide whether to allow you to read the book. If you have a skeptical expression, the cover engages a lock, preventing you from opening the book. Excuse me? I should abandon my own critical faculties and make my reading decision solely on the basis of a stranger’s opinion? I guess that’s one way to avoid bad reviews. If I can’t form my own opinion, I certainly can’t do a proper review. Hey, maybe I can put a mask showing the proper “serious reading expression” on my scanner, use Kindle Convert to convert Biersteker’s book into electronic form, and then feed it to trajectory’s software, and pass the output to a roboreporter to write my review. Bets on the number of stars RoboReviewer will give? As an ethical blogger, I have an obligation to give you, my readers, the most accurate information I available. It also means that, in the hopefully rare cases where that information later proves incomplete or incorrect, I have an obligation to issue a correction. Last September, I reported on Watanuki’s emo side. At the time, Mr. Knuckles’ preferred method of exorcising his negative feelings was to write poetry. However, it seems that’s not the full extent of his artistic tendencies. ‘Nuki also works in the fabric arts. 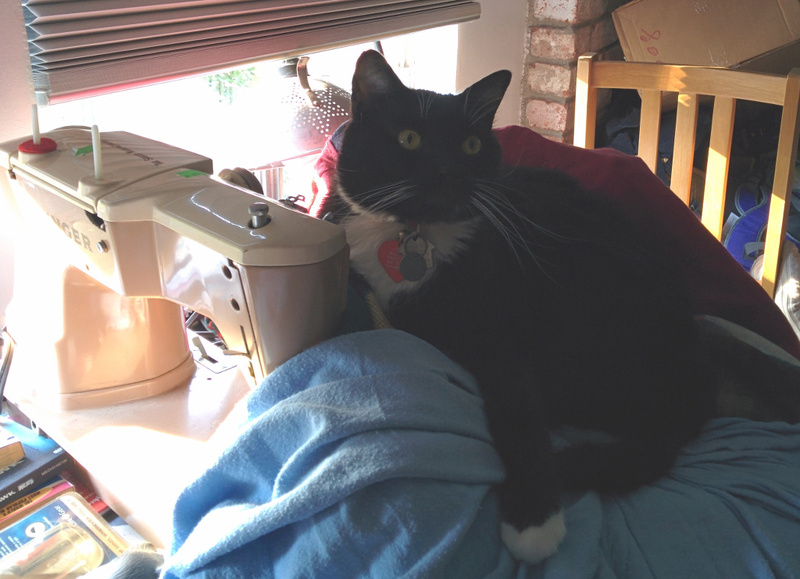 I came downstairs the other day and found that he had commandeered Maggie’s sewing machine. Before he could hide the evidence, I snapped this picture for proof. In retrospect, this does explain some of his habits. 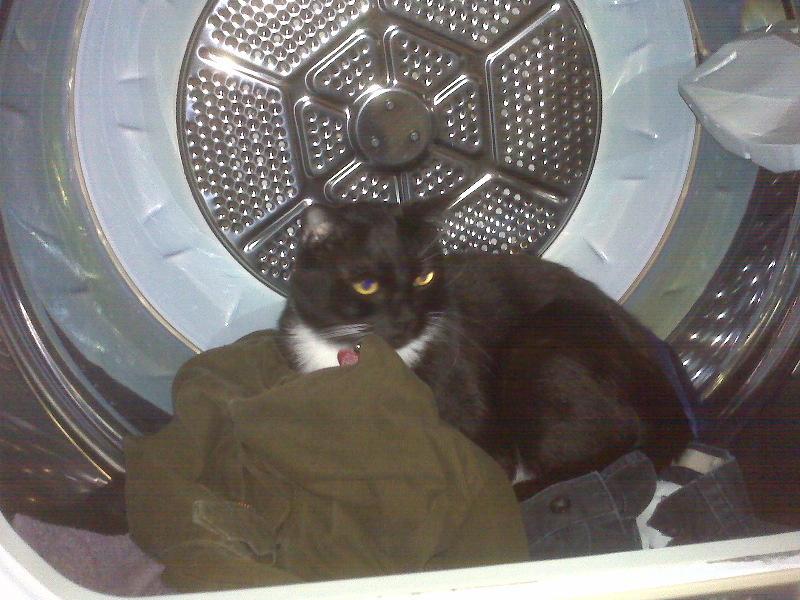 In isolation, his tendency to explore the dryer, hang out with stuffed animals, and hide under clothes and bedding passed as odd quirks. 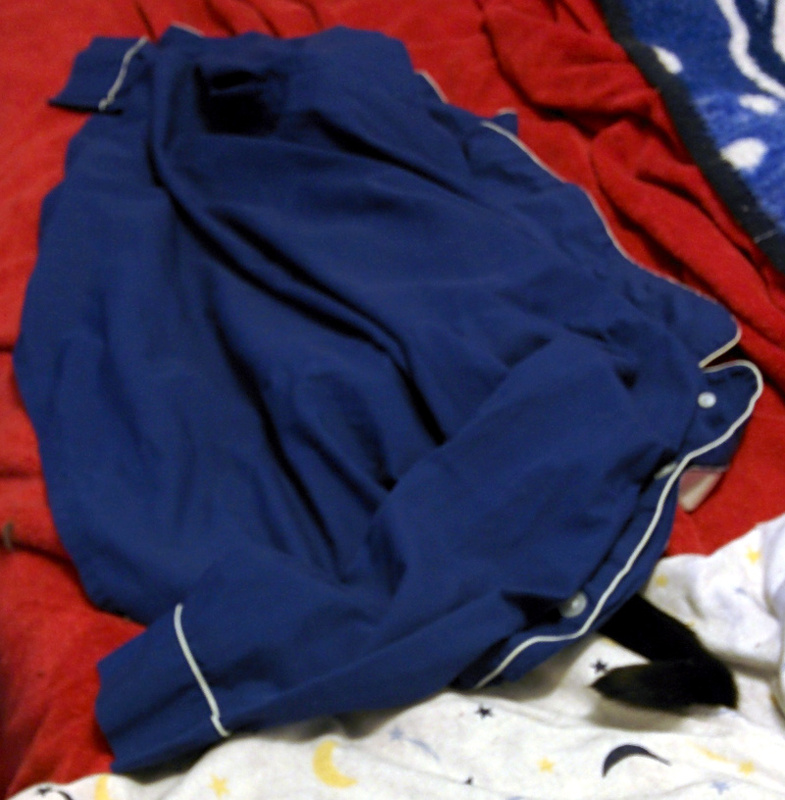 Taken together, though, they do suggest a fascination, perhaps even an obsession, with cloth goods. I’m not sure what he was working on here. The light blue fabric seems uncharacteristically cheerful for him, but perhaps he’s using it ironically. Or working on a commission. If he is selling his creations online, I’ll certainly provide a link as soon as I hunt down his site. Come to think it, this probably explains why he keeps his claws so sharp: he’s using them as needles for hand finishing. Correction: paw finishing. I’m took the show on the road last week, making the same trek into San Francisco that I used to do on a daily basis. I mostly went to hang out with some of my former cow-orkers  and doing a little shopping, but also to try out the “coffee-shop-as-a-workplace” thing. Thursday’s post was written over a cup of tea, and the first draft of this one was written somewhat later over a cup of spiced chai. I don’t think I could do coffee shops as a regular thing, but it did make a very nice break in the routine, and I’ll keep it in my “get a different perspective on things” arsenal. Nothing really profound to report as a result of the experiment, but I did get pictures of a couple of things I saw that seemed worth sharing. My apologies for the tall, skinny video. I forgot the camera doesn’t automatically rotate video the way it does still images. If you can’t see it clearly enough in the video, the water falls freely from the “shower head” at the top of the atrium into a shallow pool. Part of the fascination I have for this fountain is speculating on the path the water takes back to the top. Of course, I wish the pool at the bottom was deeper so there could be koi in it, but I realize that would be a maintenance and liability issue. Can’t have everything, I suppose. I seem to recall that there used to be a plaque with basic information about it, but I don’t see it now. Perhaps it’s under one of the flower pots. A bit of poking around on the web tells me it was designed by one Doug Hollis (here’s a decent, if rather brief, article on him that gives a sense of his interests). I’d link his own site, but it requires Flash to see anything, which annoys the heck out of me. Consider this the start of a one-person movement to refrain from linking Flash-only sites. If you’re interested in digging into it, the site isn’t hard to find. About 11:30 the pianist started playing; my cue to move on. Not that I object to pianos in general, or pianos as background music, but (a) it meant that the lunch crowd was about to show up and (b) I preferred not to hear any more of his suggestion that I should be wearing flowers in my hair. Yes, he did actually start his set with “San Francisco”. Since it was still too early to meet up, I wandered around for a while and wound up walking along the Embarcadero. And I learned something new. 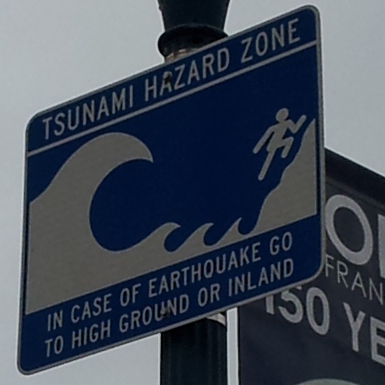 According to these signs, the Bay side of the street is a Tsunami Hazard Zone. But only the Bay side. Not only are the hazard signs only on that side of the street, but if you look across the street, you see this: See that little blue sign where the traffic light crossbar meets the vertical pole? Take a closer look: Yup. The other side of the street is the Tsunami Evacuation Route. Still not convinced that it’s only the Bay side of the street that’s in danger? 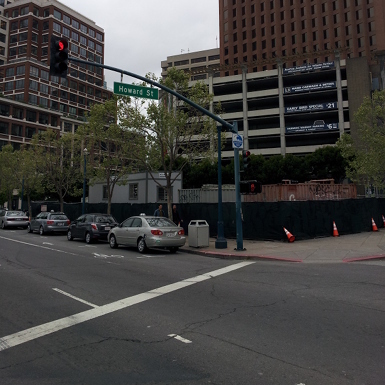 Note that Embarcadero runs parallel to the Bay. If that side of the street were in danger, why would it be the evacuation route? 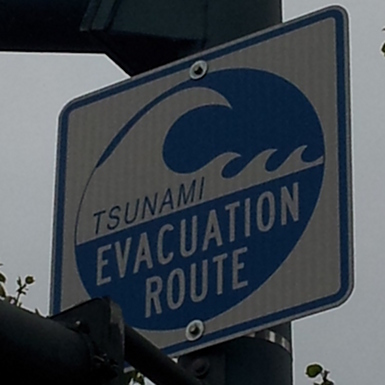 Again, all you have to do to be safe from the tsunami is cross the street, hang a left, and keep walking. Valuable information, indeed. I’m sure it will serve me well in the future. By the way, I’ve had it suggested that the term “cow-orker” is derogatory. Sorry, I disagree. I’m aware that several sites define it that way, but there isn’t universal agreement on that, and I don’t use it that way. Now, “idiot cow-orker” would be clearly derogatory, and I’ve been known to use that phrase on occasion. But by itself, the word just identifies a relationship.